Do I have to be THIS supportive? I love my mother but is there a point where you can just say a big NOPE and let her suffer on her own? My mother has had insulin dependent type 2 diabetes for over a decade now. It's difficult to control, dangerous to her long term health and requires more needles than anyone should have to bear. We know that type 2 diabetes can be helped a lot by losing weight but that's easier said than done because she also has an inactive thyroid, severe depression and has developed Parkinson's disease which is slowly reducing her mobility. Fun, right? 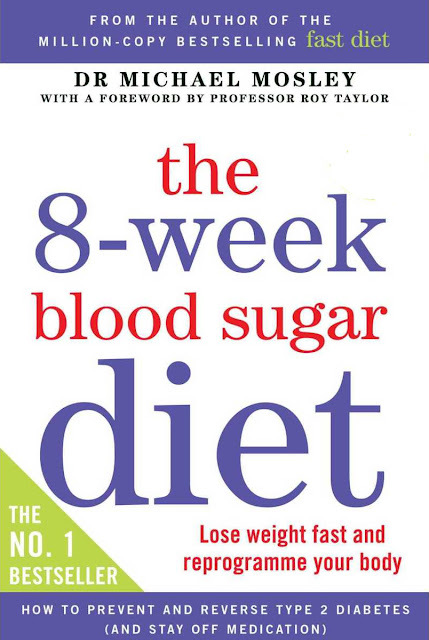 We recently came across this book by Dr Michael Mosley - The 8 Week Blood Sugar Diet. UK readers may recognise Michael Mosley. He's on a lot of the BBC health programmes like Trust Me I'm a Doctor. I'm really not a fan of crash diets. My brain has always told me that changing your eating habits for a limited period time is highly unlikely to have a lasting effect on your health. This diet however, has been scientifically researched and trialled so my scientific brain has no excuse. The research shows that rapid weight loss has the ability to remove the fat from the pancreas which is usually the cause of type 2 diabetes. Once the fat has left the pancreas 85% of patients in the trial found that their diabetes was completely reversed. Magic! The book is aimed at people in the early stages of diabetes who are treating the disease with diet and tablets. Mum is taking insulin but we've had several meetings with the dietitian at the hospital to sort out the balance of medications and we're good to go! Each of those pages is the amount of food you're allowed in a day. Look at that! That's a whole day's food right there! I naively thought that it would be easy so I told mum that I would do it with her. After 10 years of migraine medications I have gained a lot of weight and am currently sitting at 4 stone, 56lb or 25kg overweight whichever measurement you're happiest with. Plus last time I had blood tests I was pre-diabetic which is worrying. So I really should do this with her. But it's haaaard. We're 3 days in and I'm already making involuntary sobbing noises when I see a social media post of food. My question is: How bad is it if I cheat? If I stick to the diet with mum in the house where she can see me is it really bad if I sneak food when I'm out and about? I'm not even talking about stuffing with face with burgers and pizza, I just really want a banana. 1 banana can't hurt can it? I came across your blog by accident. Just to say that this diet worked well for my neighbour. She lost loads of weight in 8 weeks and completely reversed her pre-diabetes. She was following the programme from Newcastle uni and was also given nutritional drinks as part of her daily calorie intake. Stick with it! Hi Mags! I'm sorry I missed your comment. It was really tough but we stuck at it and lost quite a chunk of weight. Mum was a little disappointed that she didn't lose more but the dietitian said it was fantastic considering that she was on insulin. It hasn't been a magic bullet but she is only on 35% of the insulin she was and her blood sugars are in the best control they've ever been so it's definitely a win!